Angel having failed, appealing to Bobo having failed, it comes down to the big show down. The monster grabs Willa – who may even have planned for this: she wants death, the destruction of purgatory et al. Maybe she has a property in R’lyeh. In doing the world is returned to light again, the tentacle monster’s appendage becoming dust. Well that escalated quickly. Huge Cthulu monsters? Who Bobo et all calls the “old one”? Black badge swoops in in the aftermath and scoops up Bobo for experimenting on and Dolls because she just doesn’t like him. Yes, taking Bobo outside the boundary will do terrible things to him. I think head of Black badge will – especially since Wynonna wants to get Dolls back. Also didn’t she mention something about bombing Purgatory? On the worse side, Waverley touches the black blood and seems to become possessed: including black eyes and pointing a gun at Wynonna. Oh that’s a difficult twist. That was a definite dramatic ending – but it also opened up the world a lot and begged a lot more questions. In the end I’m left thinking even more that Constance the Bone Witch was a rather unnecessary addition considering how utterly tangential she was to the whole storyline. And since her storyline also included the rather tiresomely underused dead Blacksmith who definitely deserved better. The relationships did a lot to make me love this show. Wynonna and Waverley have a really excellent bond and it was one of the reasons why I didn’t want Willa to join and am, to be honest, quite happy to see she’s not going to be here next season. Wynonna and Waverley work really well together – they have an excellent sibling relationship. Wynonna and Doc have a fairly typical relationship which isn’t bad but is nothing new. 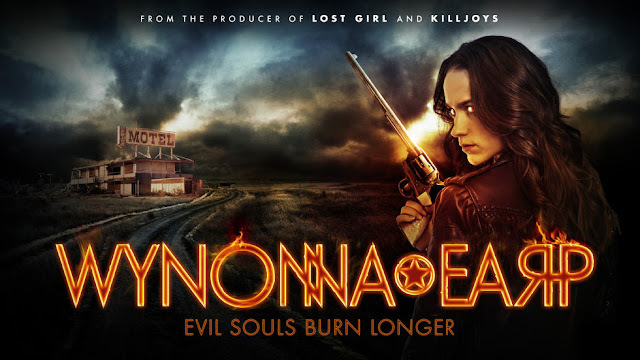 But Wynonna and Dolls has been excellent as they have grown from grudging tolerance to respect and to something more. I have loved to see their relationship develop. I also love that Dolls does have a secret, a past and more going on. While he hasn’t had any of his own storylines yet, there’s clearly more to see in this character than him just being a person in Wynonna’s orbit. I also really lime Waverley and Nicole – it started covered in a lot of heavy troping but it quickly started to progress. And we actually got a relationship with them before the season finale, that was maintained gained some really excellent support from Wynonna and, despite the fake out (which was cruel) neither of them died! I would like to see Nicole more involved in the next season since she’s very peripheral so far. And I love the snark. I love some quality snark and this show has brought it in spades. I like Wynonna with her dubious past and shaky life which she’s bringing together – and I like that she isn’t totally ashamed of that past even though she has regrets. Wynonna lives herself pretty powerfully and I do like that a lot. In all I like this show a lot – sure it may be a guilty pleasure at times and yes it can be awfully corny. But I like it and I really like Wynonna.